Add natural beauty to your home or office with air plants! These indoor plants don't need soil to grow, so they can flourish in many different environments. Additionally, they require only a moderate amount of light and only need watering about once a week, making them the lowest-maintenance plants available! What separates these unique plants from other plants are their leaves, which have adapted to absorb water and nutrients from the air. This allows air plants to thrive when they are suspended in the air or grown atop driftwood and rocks. Air plants are perfect for terrariums, cages, and glass containers with holes or gaps that allow for plenty of air flow. There are a myriad of other creative ways to display air plants; the possibilities are limited only by your imagination! Air plants look especially beautiful when set atop river stones, natural-colored gravel, or driftwood. Air plants make excellent gifts for house-warming or other occasions. They are also work wonderfully as desktop decorations for your office or home desk. We recommend keeping air plants in an area where they receive a moderate amount of light. Indirect sunlight and artificial home/office lighting are appropriate for these plants. It's generally safe to keep air plants in direct sunlight for a short period of time each day, but we recommend misting them with water every 2 hours or so to keep them from drying out. The optimal way to water air plants is to soak them in water for 2 hours once per week. If you find the leaves of your air plants are becoming soft or pale in color, this means the plant is too dry, and you should try misting or watering them more often. Air plants come in a variety of shapes, sizes, and colors, though most species primarily feature green leaves. Many of our air plants also exhibit stunning pink blooms. Each air plant ranges from 4 to 10 inches in size. The plants you receive may or may not already have blooms. Also included is an 8 oz atomizer bottle for watering and/or fertilizing your air plants. This atomizer bottle makes a very fine mist that is ideal for watering tillandsia air plants. LARGE AND MATURE TILLANDSIAS: Your plants will range from 4 to 10 inches, and all of them will be mature, established specimens. 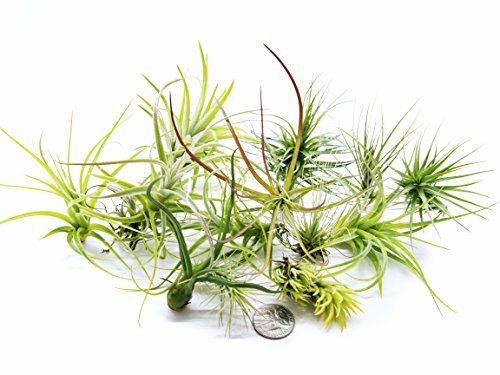 Most air plants sold by competitors are cheap 2 to 3 inch tillandsias that are much more difficult to establish in the home. EASY CARE HOUSE PLANTS: Our Tillandsia Air Plants are extremely low maintenance and easy to care for. Their larger size means you won't need to water or fertilize as frequently as the smaller plants sold by competitors. HEALTHY LIVE ARRIVAL GUARANTEED: Your air plants will arrive alive and healthy. Each order comes with our 100 percent live arrival guarantee and free email support. DIY HOME DECOR: These live tropical plants are perfect for do it yourself terrarium kits, holders, and hanging planters. They are ideal for indoor decor and make very unique housewarming gifts for both women and men. Your creativity and ideas are the only things that will limit what you can do with them.